It didn't take long for one of Sky Bet's 'Champion After' markets to be won. 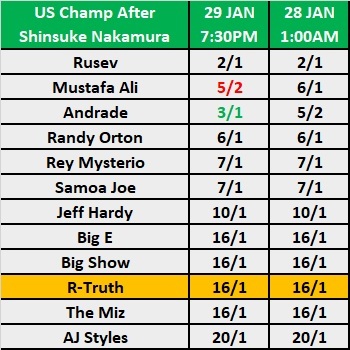 In a post published last night, I noted that the sports betting company released a market where its customers could place wagers on who they thought would succeed Shinsuke Nakamura as WWE United States Champion. The market was published shortly after Nakamura regained the title from Rusev on the Kick Off show before the main Royal Rumble card. 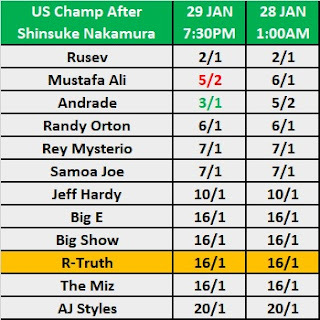 In the post - I noted that Mustafa Ali was the early bettors' choice to beat Nakamura for the strap as he was moved from 6/1 into 5/2 second-favourite. During the show, Nakamura dropped the title to R-Truth. The new champ was being offered at 16s ahead of last night's show. All of the prices can be found below. Nope, cant do it. What's WWE thinking with this? It's a reward for Sunday, if you ask me. Makes sense... I guess that's the reason nakamura won the title back because r truth beating nakamura is better then rusev..? It just seems like a weird mess now. I really hope he comes out and does a promo about being intercontinental champion or something. It wouldn't have worked with Rusev as he would have still been a babyface had he left the Royal Rumble with the strap. They used Nakamura as the transitional champ because he is a heel and could drop it to R-Truth.